Rydin has been in business for over 60 years, and strives to build relationships with our customers. Many have been printing their permits with us for a long time, and the level of trust is high. When following up on orders, we noticed a theme: customers were thrilled with the quality of the permits, and the on-time delivery, but still sounded frustrated. We asked why. One of the biggest reasons was permit distribution. 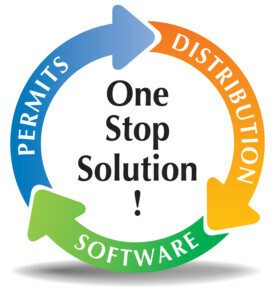 Getting permits in the hands of the drivers can be stressful. Our clients were either having all the drivers come to a school office to pick up, or the staff had to stuff envelopes and put them in campus mail. Either option took time away from the staff’s regular duties, and caused stress. Someone asked if we could just mail them directly to the drivers. This is how Rydin Parking Permit Distribution Services were born. It’s a win-win. The drivers are happy because they no longer have to take time out of their busy schedule to pick up their permits. Your staff will be thrilled that the amount of office has been greatly reduced, or they don’t have to spend time stuffing envelopes. Whether you issue 100 permits or 50,000 permits, Rydin has you covered. Our experts will prepare your parking permits and any other inserts, mail them directly to your parkers – and get them to your recipients on time! Simply upload a CSV file with students’ names, mailing addresses and permit types to our secure FTP site. Our expert Data Processing Team is automatically notified and will begin to prepare your files for processing. Our team will collate each parking permit into an envelope, along with an introduction letter. You can choose to include other important literature, such as: Rules and Regulations, University Information, or Campus Maps. Orders are processed and typically in the mail within 48 hours, unless an exact mailing date is specified. The parking permits are sent directly to your students, faculty and staff at the addresses you provided. You will receive an updated database that indicates who received which permit number and when their packet was sent! To download a PDF about Rydin’s Distribution Services, please click here.